Pigasus presents a retrospective of Zbigniew Kaja, who has died in 1983. In his lifetime Kaja was renowned as one of the most important artist of Polish School of Poster but later he was unfortunately almost forgotten. It is difficult to find his works today. The family of Zbigniew Kaja tries for many years to archive his estate. This attempt is sometimes unsuccessful while a lot of artist's works are unsigned and spread around the world. In our August exhibition we will present around 40 Posters by Zbigniew Gaja. Graduated from Poznan ASP, 1951. The painter, a graphic designer, a stage designer, and a costume designer. 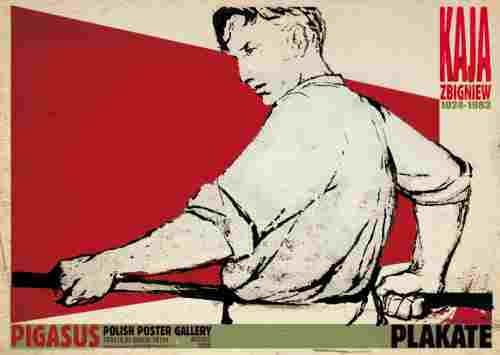 The creator of over 300 posters, was one of the creators of the "Polish school of poster-making". Prints, Posters, commercial art, stage designer, book illustrations, display desig . Individual shows : Poznan 1951, 53, 56, 58, 59, 64, 76, 78, 81; and after death 1985 ; Prague - 1957; Dessau - 1958; Kalisz - 1964, 1975; Rzeszow - 1965;Leipzig - 1961; Sydney - 1970; Dessau -1959; Warszawa-1965 ; and many others Participated in many exhibits abroad, both group and individual : Germany , Korea , Australia , China , USSR, France , Hungary, Norway and others. City of Poznan Award for engravings and Third prize at National Exhibition of Illustration , Posters and Small Forms, 1955; Commendations at Poster Exhibition and at the Prints and Drawings Exhibition of the cycle "Polish Arts on the 15th Anniversary of the Polish People's Republic ", 1961; "Warsaw Poster of the Year " award , 1962 ; many prizes and diplomas at prints and poster competition Knight's Cross of the Order of Polonia Restituta for services to art.